WANT TO START THIS TOUR IN K.L. RATHER THAN BANGKOK? Can do. Please contact us. This short Malaysia small group tour is suitable for those in transit through Bangkok and with enough time to get a taste of Malaysia and a few days beachside also. Two included flights maximise our time even more. If you want an easy introduction to the region then Malaysia is a great choice. Welcoming, Safe, hassle-free and with food unrivalled anywhere else on earth. Malaysia has it all and is truly Asian. You will get a look at some of Penang’s rich history, have the opportunity to do some shopping and sightseeing and then take a relaxing island beachside break on Langkawi while all along the way trying the food. A short taste of Bangkok is thrown in also. Once you visit Malaysia you will only want to return again and again as it is possibly the most addictive country in the world for both food and even more so for the friendly faces. ACCOMMODATION = (4 star hotel x 3 nights, 3 star hotel x 3 nights, 2 star hotel x 3 nights). BANGKOK - PENANG ISLAND - LANGKAWI ISLAND. 9 meals included as per itinerary. Tonight our Malaysia small group holiday tour package will stay in; BANGKOK - Our short Malaysia small group tour officially starts when we check into our Bangkok riverside accommodation. A welcoming dinner will be had in the evening. D.
If you arrive early enough your free time could be spent visiting the enormous Chatuchak weekend market and/or, Wat Phra Kaew & the Grand Palace, Wat Pho, Wat Arun, MBK or Siam shopping centres or take a boat with the locals on the Chao Phraya express to some local shops/markets in Nonthaburi with the river activities fascinating on their own. A few of the dozens of other options may be Vimanmek Teak Mansion, Chinatown, Wat Traimit, Jim Thompsons House, Silom or Sukhumvit road shops. OR? Maybe just lay back and have a traditional Thai Massage. A month in the capital wouldn't allow you enough time to see it all. Tonight our Malaysia small group travel tour will stay on; PENANG - A short international flight will see us in the budget food capital of the world, at least in our opinion. 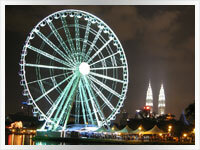 The best destination for getting a first up taste of Malaysia. An amazing atmosphere of both past and present history and cultures all in one. Malay, Chinese or Indian food in all directions with the latter having some amazing choose and point restaurants with an amazing number of dishes to point at. Make sure you take note of the locals in regards to both ordering and eating to get the most out of it all. Truly a tour highlight. B.
PENANG - A free day to explore & experience some of the above. But without doubt, the main purpose of coming to Penang is the FOOD! The usual Malaysia advice is once again; forget seconds at the hotel breakfast. 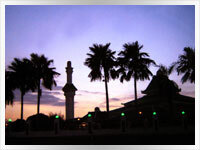 Our accommodation is within a few minutes walk of a multitude of Malay, Chinese or Indian restaurants. Penang's Curry Laksa or Indian Tandoori chicken with Garlic Nan bread is just but 2 of the better known local favs. This will also be your first chance to eat the local way with a Banana Leaf Meal and it doesn't get much better than a bottomless one at Krishna Villa restaurant in Little India. B.
PENANG - Another free day to continue our exploration of yet more food shopping and sights or maybe get a local bus or taxi and explore the island at large with beaches and villages adding another dimension to it all. B.
Tonight our Malaysia small group tour holiday package will stay on; LANGKAWI - An early start and a ferry ride will see our group tour on lovely Langkawi Island by lunchtime for three days of relaxation. If Penang equates to food then it's beaches and maybe a beer for Langkawi. Being a duty-free island the beer is the cheapest in Malaysia. At the same time though please respect the local culture if they ask you not to drink it in certain places. No meals. LANGKAWI ISLAND - Our seaside accommodation and the warm waters will see us in relaxation mode for our last days in Malaysia. Beachside or some strolling are the main two choices today. OR? If you must then take a taxi to one of the duty-free malls. B.
LANGKAWI ISLAND - Repeat day 6. Another day in a tropical paradise. B.
Tonight our small group Thailand & Malaysia adventure travel tour package will stay in; TRANG - Today we head back to Thailand the soft adventure Baktrax way. Firstly a local ferry back to the Thai border province of Satun. Then after immigration duties a local bus to nearby Trang for an overnight stay in this interesting southern Thai town. A REAL Thai evening food market will give us the opportunity to experience dining with the locals. Khanom Jeen, (Chinese noodles- mild, medium or fire? ), is one of the famous Trang dishes. No meals. Tonight our Thailand & Malaysia small group tour package will stay in; BANGKOK - Our group tour will take a short domestic flight from Trang to Bangkok for a final night. Rest of the day at leisure. A farewell dinner will be had in the evening. Being a Sunday and with time permitting you may wish to visit the gigantic weekend market, or maybe you'd rather visit one of the famous Bangkok temples within easy reach of our accommodation. Very few people ever get bored in Bangkok. Just watching the amount and chaos of the traffic is entertaining enough in itself. B. D.
Our Malaysia small group holiday tour package is officially over when we check out of our Bangkok riverside accommodation. An airport transfer is included also. B. Can you get a more relaxed vacation and experience others cultures in one go?